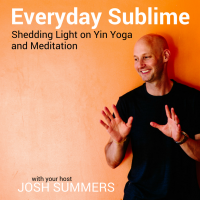 In this episode, I explore the second of four main principles of practicing Yin Yoga: Relaxing the Muscles. You’ll learn what muscles to relax, why you want to relax them, what to do when they stop relaxing, and what muscles you might engage during a Yin Yoga pose. Listen to Episode 3 here or subscribe in iTunes or your favorite podcast app. For an in-depth exploration of the theory and practice of Yin Yoga, please join me in a new online course produced by Yoga Journal: Yin Yoga 101: The Benefits of Slowing Down. Use discount code JSUMMERS for $75 off the price of the course. A comprehensive program for serious students and teachers to pursue Yin Yoga and Meditation. 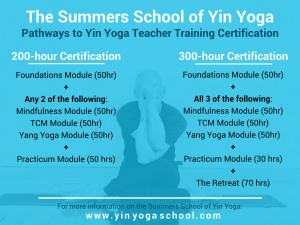 Choose to work towards your 200-hr or 300-hr Yin Yoga Teacher Training certification (Yoga Alliance approved), or simply take whichever modules you like for your own development and practice. >> Click here for more info. Study with me! See the complete program at www.yinyogaschool.com.